A recent announcement from the Office of the Surgeon, Headquarters, U.S. Continental Army Command (USCONARC), disclosed that malaria has cost the Army more than 253,050 man-days lost during 1967. In making the report, the Office of the Surgeon pointed out that more than 6,000 soldiers were infected with malaria while serving in Vietnam. Another 1,230 men, returnees from Southeast Asia, were reported as malaria cases in the U.S.
Why? There is a good possibility many of the men did not follow the anti-malaria rules prescribed by the Surgeon, Hq., U.S. Military Assistance Command Vietnam. Take an anti-malarial pill weekly. In certain "hot" malaria areas, an additional tablet must be taken every day. Button up collars and roll down sleeves at dusk. Use insect repellent on all exposed skin surfaces. Sleep under mosquito nets and spray enclosed areas liberally with an aerosol bomb. These are personal measures. In addition, the individual must cooperate fully in his unit's anti-malaria actions. Service in Southeast Asia really calls for firm adoption of the motto, "An ounce of prevention is worth a pound of cure." Will Your Friends Kill You? 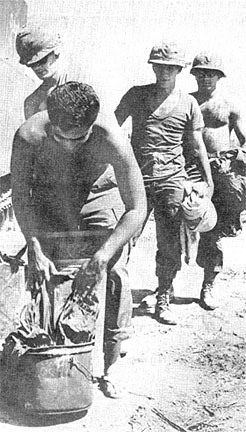 SAIGON (MACV) - Reports of servicemen carrying explosive devices in personal baggage have triggered grave concern about the possibility of disastrous situations aboard aircraft. Commanders of U.S. Armed Forces elements in Vietnam have been directed to take additional steps to prevent U.S. servicemen from transporting in their personal baggage dangerous materials as explosive devices while traveling aboard aircraft. The actions planned will include briefings, physical inspection of luggage and instructions to be included on individual travel orders. Spokesmen at MACV say the practice of carrying explosive materials in personal luggage poses grave danger to passengers and air crews of both military and civilian aircraft. 1) Briefing of all Armed Forces members regarding prohibited explosive devices aboard aircraft, the extreme danger involved and the penalties associated with violations. 2) Physical inspection, to the maximum extent possible, of all personal baggage for explosive devices at processing centers and assembly points. Initial inspections most likely will be made at unit level. 3) All travel orders will contain special instructions prohibiting the carrying of any type of explosive device in personal baggage aboard military or civilian aircraft. The actions described pertain to all who are traveling on permanent change of station, temporary duty, leave, R&R and permissive TDY orders aboard Military Airlift Command, MAC charter flights and all other military aircraft operating from or within the Republic of Vietnam. Ideas are valuable and in Vietnam there are times when they can be measured in terms of lives saved as well as dollars. The branches of the U.S. Armed Forces look to all military grades and civilian employees in all fields of endeavor for suggestions that can help do a job with greater efficiency or provide savings in manpower and costs. The need for these is obvious, particularly in Vietnam. A good suggestion may help accomplish a job faster, better or cheaper; simplify or improve operations, methods and organization; conserve materials and property; promote health and improve working conditions; reduce the likelihood of accidents; and it may improve morale through better personnel services. Also sought through the various suggestion programs of the services are patentable inventions that may be used to benefit the American public. Servicemen and women and civilians can submit scientific or technological ideas which may be able to materially advance the research and development accomplishments of the Department of Defense. Depending upon the tangible benefits to the service, the suggestion may earn cash awards ranging from $15 up to $25,000. The basic idea behind the various suggestion plans of the services is that no one knows a job as well as the man or woman who does it. The offer of cash is an inducement to the individual to draw on his knowledge, experience and imagination to find better ways to do the job. The prospect of saving the lives of fellow servicemen fighting in Vietnam or providing them with more efficient support operations or better tools to do their jobs is an added inducement. SAIGON (MACV) - The number of civilian and military members of the Viet Cong ranks who have rallied to the Government of Vietnam in the Chieu Hoi (Open Arms) program this year continues to rise, as this year's total hit more than 4,200 above that for the entire year of 1966. Recent reports show that 2,171 left the Viet Cong ranks between the dates of Sept. 9 - Oct. 20, raising the 1967 figure to 24,646. 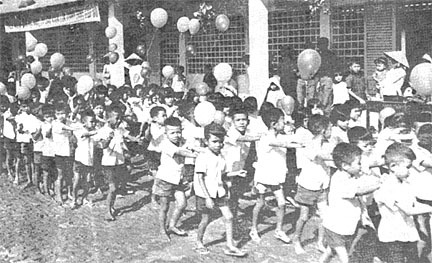 The 1966 total for Hoi Chanh (returnees) was about 20,400. Chieu Hoi is a program that encourages military and civilian Viet Cong, their political cadre and soldiers of the North Vietnamese Army to rally to the legitimate government of the Vietnamese. It offers the hand of friendship and the hope of a new life for those who do. Included in the latest compilation of Hoi Chanh figures were 1,562 military, 494 civilians and 115 in other categories. Since the program was started by the South Vietnamese government on April 17, 1963, a total of 72,733 of the enemy have become Hoi Chanhs. Highest monthly and weekly totals for the four and a half year program were: 5,577 for March 1967; and 1,198 for the week ending March 11, 1967. The average weekly rate of Hoi Chanhs during the current year is 587. U.S. Army personnel being discharged after Dec. 15, 1967, will be issued a new discharge certificate. The size of the certificate has been changed, and the U.S. eagle is now printed in full color. The words "Army Of The United States" have been changed to "United States Army." A green vinyl folder with the War Office Seal stamped on the front cover will be made available exclusively for encasing the discharge certificate prior to issuing or mailing it. WASHINGTON (ANF) - Officials of a majority of U.S. civilian airlines have informed the Defense Department that Military Reservation Fares will not apply during the Christmas and New Year holidays. Normally, servicemen on leave can travel on civilian airlines at two-thirds the usual fare, but the special rates will not apply because of the high rate of travel during the holiday season. Additionally, servicemen are cautioned that unreserved seats will be extremely limited during the holidays, making travel by Military Standby Fares difficult. DAU TIENG - Since arriving in Vietnam SGT Stewart Smith, Norfolk, Va., a member of the Recon Plt, 2nd Bn, 12th Inf, has carried a Bible and was glad he had it during a recent attack on the forward base camp of the battalion 112 kms northeast of Saigon. The 3rd Bde, 25th Inf Div, soldier was moving forward to reinforce a position of the perimeter which was under heavy fire. "I had just started to move when I was hit and knocked to the ground," related Smith. Lying on the ground Smith could find no wound so he moved to the forward line of the perimeter. "The next morning I found out why the bullet hadn't done any damage," continued Smith. "Luckily it had been stopped by the Bible I always carry." Ironically enough the bullet had penetrated to a page which had a passage of Paul to the Colossians, which reads, "We give thanks to God and the Father of our Lord Jesus Christ, praying always to you." No doubt, Smith will never forget to give thanks and will carry his Bible for the remainder of his tour. DAU TIENG - The 3rd Bde, 25th Div. swimming pool was officially named the 1LT Joel T. Willis Memorial Pool in a ceremony here recently. "Lieutenant Willis will be remembered by all those who knew him," commented COL Kenneth E. Buell, 3rd Bde commander. "His perseverance and bravery were an example for all of us to follow." When Willis of Stockton, Calif., first saw the swimming pool built by the French at the Michelin Rubber Plantation base camp, he recognized that it could be one of the biggest morale builders the unit could ever have. At this time, the huge 13-foot deep pool had decayed from many years of disuse. The bottom was coated with several feet of muck and trash, the shower room below was strewn with waste and the paint had cracked off the walls. Willis, then the Special Services officer, organized workers to clean up the pool. He worked quickly and within a month, the water surged into the freshly painted walls of the main tank. 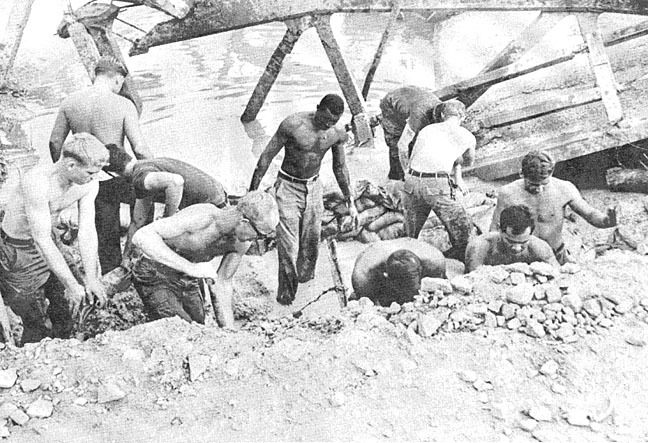 From that day on, the "swimming hole" at Dau Tieng has been a welcome site for the men coming back from Operations Junction City, Manhattan, Cedar Falls and many more. Two or three days of the "good life" around the pool revitalizes the combat weary soldier and gives him something more than a tent to return to. For "Joe" Willis, the men using the brigade pool meant something special to him and he volunteered to serve with them in the field. One month after Willis left for duty as a platoon leader with the 2nd Bn (Mech), 22nd Inf, an enemy claymore mine ended his life. A Viet Cong-smashing artillery tactic being demonstrated by a 25th Inf Div battalion commander recently had very real results. Company commanders of the 1st Bn, 27th Inf "Wolfhounds," watched LtC David Hughes explain the use of minimum range artillery fire. Used to defend base camp perimeters, the tactic involves lowering a 105mm howitzer to its lowest elevation and firing point blank at advancing enemy troops. While Hughes spoke, a perimeter guard reported enemy activity on three sides of the camp. The demonstration quickly turned into the real thing, and the company commanders got a live fire example of what the tactic could do. Army marching drill recently directed a 25th Inf Div platoon lost in high grass and brush to a Viet Cong position where they detained two enemy soldiers. The platoon, an element of the 1st Bn, 27th Inf "Wolfhounds" was making a combat sweep as part of the 2nd Bde's Operation Kolekole when the lieutenant in charge became disoriented. At the same time, brigade commander COL Edwin W. Emerson of DeLand, Fla, radioed Wolfhound commander LTC David Hughes of Colorado Springs, Col, that he had spotted two VC ahead of the unit. 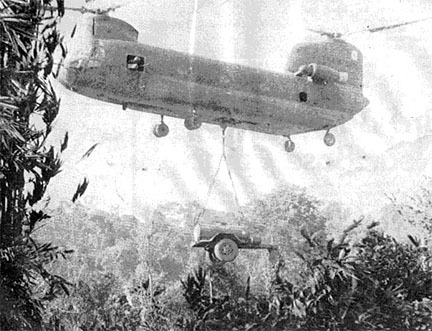 Hughes' solution to the problem came as he orbited over the lost platoon in his command helicopter. He gave the platoon leader marching commands over the radio. With a series of column rights, column lefts, and forward marches he put the unit on line in front of the VC position. The platoon assaulted and captured both armed enemy soldiers with no casualties. Chaplain (MAJ) Thomas McInnes says he hopes never to miss another Sunday service in the field with the 1st Bn (Mech), 5th Inf. The 25th Inf Div troopers hope the same. 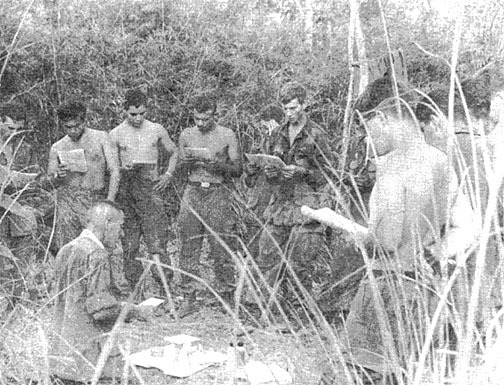 For nearly a year the 2nd Bde chaplain from Warren, Pa., has held regular church services with the unit from War Zone "C" to the swamps of Hau Nghia Province. "Never once did we have trouble with the enemy mortar or sniper fire when he was there," recailled former battalion surgeon CPT Murray Rothberg of North Plainfield, N.J. Recently the chaplain missed a Sunday when the brigade headquarters underwent an inspection. 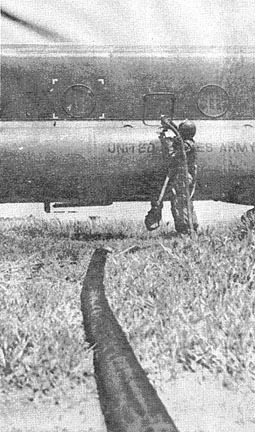 Just about the time the service would have started Viet Cong mortar rounds began falling into the mechanized base camp. Several soldiers were wounded. McInnes has promised the men never to miss another service. They say they plan to hold him to it. 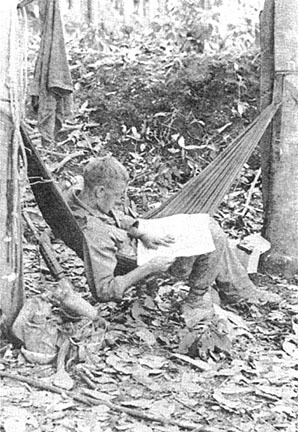 DAU TIENG - An alert listening post of the 2nd Bn, 12th Inf, accounted for two VC killed and a very close call for SGT Roy Williams, Memphis, Tenn., one of the soldiers who manned the post. The 3rd Bde, 25th Inf Div, battalion had set up their forward base camp for the night northeast of Loc Ninh when the VC began to probe the battalion perimeter. "It was very dark and I could hear the VC moving in on us," related Williams. "I wanted to make sure just where they were before we moved back to our own perimeter so I continued to wait and listen." "All of a sudden I saw a VC right in front of my position so I opened up and he fell," he continued. "Then I heard one of his buddies mumble something behind me so I whirled and let him have the rest of the magazine." After that the LP began to move back to the battalion's perimeter but the VC opened up on them and William's helmet was knocked from his head. "I found the helmet the next morning with a bullet hole which had penetrated the steel pot," said Williams, "but had stopped between the pot and my helmet liner." Was the sergeant scared during the action? "SCARED, everything happened so fast I didn't have time to get scared until it was all over," he said. In a sharp exchange of small arms and automatic weapons fire north of the Iron Triangle, a 25th Inf Div unit recently killed four enemy women soldiers. The four were part of an eight-man force that attacked a small 2nd Bn, 27th Inf "Wolfhounds," ambush patrol. LTC Walter Adams of Washington, D.C., battalion commander, reported the fighting took place in jungle so thick that visibility was limited to a few feet. The women were dressed in full field web gear and all wore uniforms. Later in the day the unit assaulted a bunker in an area so thick that small recoilless weapon rounds were deflected before they could reach the position. Soldiers repeatedly said they heard female voices inside but when they approached they were taken under intense enemy fire. "The enemy soldiers, male and female, that we are running up against in this area are not stopgap forces," said Adams, "they are real professionals." U.S. Army engineers displaying versatility and expediency reopened two vital roads near the village of Dau Tieng, about 80 kms northwest of Saigon, that were rendered impassable by Viet Cong forces using explosives and mortars. Engineers from Delta Co, 65th Engr Bn, found a multitude of tasks facing them the morning after a four hour mortar attack on Nov. 9. The ancient Bailey bridge on Route 239 that connects Dau Tieng to the outside world had been partially destroyed along with a culvert and a Timber Trestle bridge on TL14, a road used by the villagers of Xon Ben to bring their produce to market, and U.S. armored vehicles used on reconnaissance and search and destroy missions. 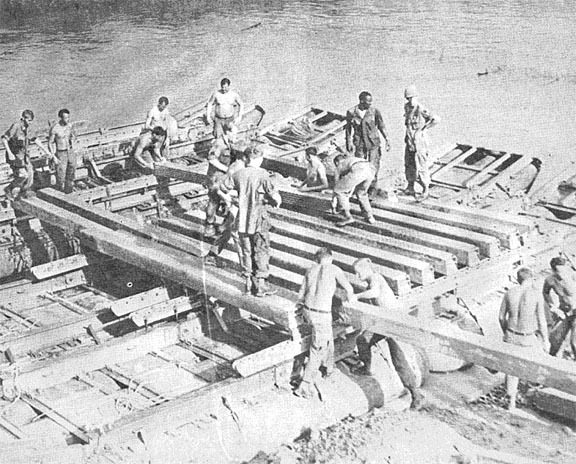 A preconstructed Float bridge from Echo Co, 65th Engr Bn, requiring several sorties by Chinook from Cu Chi to Dau Tieng, was emplaced by Delta's engineers and engineers from the 588th Engr Bn to substitute for the damaged Bailey bridge. Using heavy beams, planking, corrugated steel pipe, and rich, red laterite, two squads from Delta Co then proceeded to repair the damaged culvert and Timber Trestle bridge. 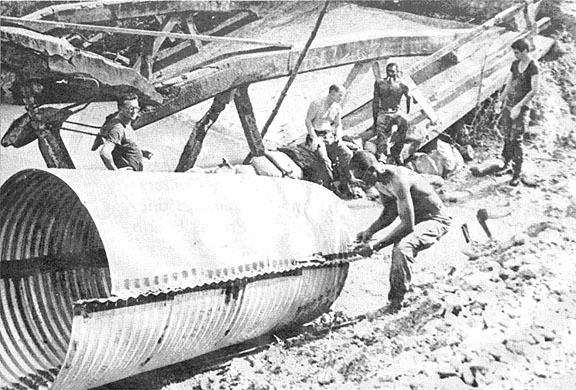 ARMY ENGINEERS FROM DELTA CO, 65TH ENGR BN, EMPLACE A CORRUGATED STEEL CULVERT NEAR DAU TIENG. 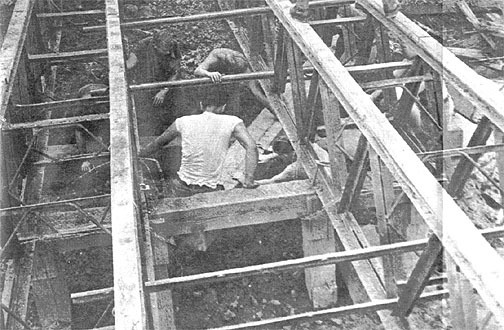 ARMY ENGINEERS HASTILY CONSTRUCT A TIMBER TRESTLE BRIDGE ABOUT 80 KMS FROM SAIGON NEAR DAU TIENG ON THE ROAD TO XON BEN. ARMY ENGINEERS FROM THE 65TH ENGR BN CONSTRUCT A FLOAT BRIDGE NEAR DAU TIENG. ARMY ENGINEERS REMOVE DAMAGED CORRUGATED CULVERT SO NEW ONE CAN BE EMPLACED. DOOR GUNNER FILLS CHOPPER BEFORE TAKEOFF. A CHINOOK GETS ITS TANK FILLED. The only service station of its kind in Vietnam is helping to alleviate some of the problems that are connected with refueling a divisions' entire helicopter force. The 341st Avn Det, under the 25th Avn Bn, built and is servicing the refueling point at the Viking resupply pad. 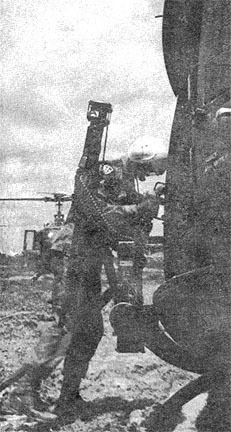 The system, originally conceived by the II Field Force G-4 Office and 1st Log Petroleum Directors Office, is capable of serving 30 choppers at one time, whether they be Menehunes, Hueys, Chinooks or Flying Cranes. 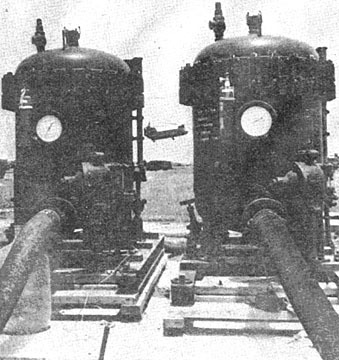 Fifteen days were taken to build the system that has two large bladder tanks, filled by POL tankers. The fuel is pumped from the tanks through three large filters to insure the purity of the volatile liquid. Along the 2,400 feet of pipeline there are 30 flexible hoses, capable of up to 50 gallons per minute each, including four directly to the Chinook pads and two for Flying Cranes. In an average day, 38,000 gallons of fuel will flow through the pipes. CPT Bobbie Pedigo, CO of the detachment and air field commander, stated, "Five other systems are being put in now in the III Corps area. All are patterned after the Cu Chi installation." Pedigo added that "the system can completely refuel a Huey chopper in slightly less than four minutes." With the new system, a bevy of helicopters preparing for a company sized move can all refuel at the same time. Even though no stamps are given with a fill up, the service is the best possible. THESE FILTERS INSURE PURITY OF FUEL. ONE OF TWO FUEL BLADDERS INSTALLED BY THE 341ST AVN DET. A blood-stained leaf and a glimpse of a man darting into a hedgerow led to the detention of five Viet Cong recently during a search and clear operation. 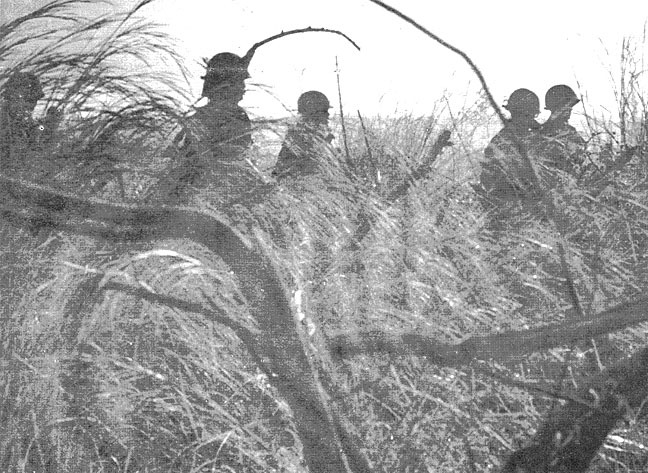 Elements of Bravo Co, 2nd Bn, 27th Inf "Wolfhounds," were moving to secure a night base camp when aerial observers spotted a man crashing into a hedgerow. Within minutes, the 25th Inf Div officer came upon a spider hole concealed with bamboo and mud. Nearby, he detected a branch smeared with fresh blood stains. Peering into the hole, he noticed a VC pistol belt and web gear, stepped back, and fired into the hole. A moment later the pistol belt came flying from the hole, followed shortly by a VC with his hands raised. An interpreter questioned him and the VC admitted he knew the location of several more enemy. He then led the 2nd Bde soldiers to a small house, where they found two men hiding amidst furniture piled on top of a bunker. They also detained two women living in the house. Officials later confirmed all five as VC. DAU TIENG - When an Army sergeant major sees any of his troops in the field violating noise or light discipline he usually lets them know it - and fast. This is exactly what SGM Yukio Suenishi of the 2nd Bn, 12th Inf "White Warriors," did recently - but the man with the flashlight wasn't a member of his battalion. The 3rd Bde, 25th Div, battalion had set up their command post for the night in a small clearing northeast of Loc Ninh. At about 9:30 p.m., Suenishi saw a group of men heading toward him through the rubber trees. The lead man was carrying a flashlight. "When they got to my position, I grabbed the lead man by the shoulder and asked him what they were doing with the light on, and walking in the dark," related the Hawaiian veteran. "He just shrugged my shirt grabbing tactics and the eight men quickly moved on." When the wandering group reached Delta Co's position, a few feet from Suenishi, they were recognized as Viet Cong and the lead man was tackled by 2Lt John R. Oosterhuis of Ogilvie, Minn. 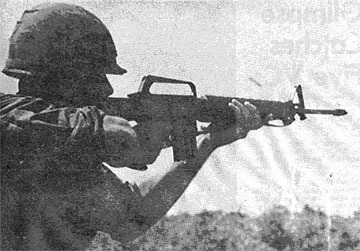 The aggressive young officer wrenched the AK-47 assault rifle from the Viet Cong's hands, as the other Charlies scattered within the battalion's defensive perimeter. One by one, the White Warriors hunted down the remaining VC in the dark, until two hours later, four Viet Cong were killed and four suspects were detained. There were no US casualties. A 25th Inf Div lieutenant became a jack of all trades recently when he held four different positions in three days. 1LT Ronald J. Marsh of New Kensington, Pa., began the week as assistant S-2 for the 1st Bn. 27th Inf "Wolfhounds." When the regular S-2 was appointed a company commander, Marsh became chief intelligence officer for the battalion. Then the captain he replaced was wounded in action, so the headquarters company commander took over the rifle company. Less than 12 hours later, that captain was also wounded, so Marsh took over the company. Finally, another captain joined the battalion, so Marsh relinquished his command, again less than 12 hours after it started. Marsh is again acting as battalion intelligence officer. DAU TIENG - A member of the 3rd Bde, 25th Inf Div, is being called "Mr. Lucky" and for good reason. PFC Samuel A. Spinuzzi was with the lead elements of Alpha Co, 2nd Bn, 12th Inf, as they came upon a small VC base camp area. With the base camp apparently deserted, the point squad continued through, leaving the bunkers for the trailing elements to destroy. Spinuzzi's squad, which was past the VC positions, hurried back to help reinforce the ambushed men. "As we approached a bunker, a VC jumped up and opened fire," related the young soldier. "I hit the dirt and rolled away but that Charlie was a pretty good shot." Spinuzzi's steel helmet had eight bullet holes in it and a ninth round had ventilated his shirt sleeve. "Mr. Lucky" didn't have a scratch. DAU TIENG - "The Viet Cong must have moved out in a hurry," said SGT James C. Bradley of Jamaica, N.Y. "They just left the weapons laying there." Bradley was with the 25th Div's 3rd Bn, 22nd Inf, during a sweep of the jungles north of the Michelin Rubber Plantation when his company discovered a recently occupied Viet Cong base camp. While searching one of the huts in the camp, Bradley found eight bolt-action rifles, a machine gun and a 60mm mortar tube lying on the floor. "Luck was really with us," commented Bradley, "because we soon found 16 booby traps scattered around the area. Someone didn't want these weapons to be captured." U.S. 25th Inf Div troops have launched another push into the long time Viet Cong stronghold in the Iron Triangle, 46 kms northwest of Saigon. The operation, named Atlanta, met heavy enemy resistance Nov. 21. Two communist attacks on two forward support bases were beaten off that night. Infantrymen have killed 36 enemy soldiers since the operation began Nov. 18. U.S. casualties are listed as six killed and 99 wounded. The multi-brigade operation had met little resistance during the first three days of sweeping the rubber plantations and thick jungles. 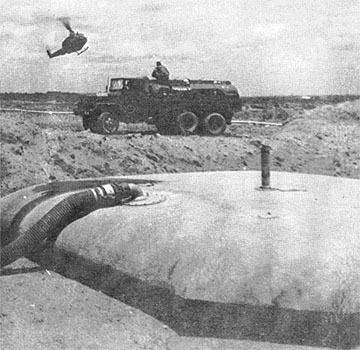 Several VC base camps were found during the first four days of the operation. The camps were destroyed, along with nine tunnel complexes and more than 40 bunkers. In addition to the 36 communists killed, the infantrymen have captured 14 weapons and over 6,000 rounds of ammunition. The Mercury Lions Club of Hampton, Va., is sponsoring a program called "Project Mail Call." The club has made arrangements with the local school system of Hampton to furnish the students, both as classes and as individuals, with names and addresses of men in Vietnam who would like to receive and send mail to school-age children. Since the project was started, back in September, 60 men have written and are now corresponding with the students. However, the response from the schools was so great that there are still over 200 classrooms wanting the name of a serviceman with whom they can correspond. Wives of Vietnamese soldiers, like their American counterparts, frequently work to help support a family. This is not uncommon with wives of the 49th Regt soldiers at Hoc Mon, 18 kms northwest of Saigon. To allow mothers of young children freedom to work and to provide education for these children, a day nursery has been built at Hoc Mon by soldiers of the 49th Regiment with the assistance of the 25th Inf Div's 2nd Bde at Cu Chi. Much of the planning was done by MAJ Phuong, the regimental rear commander. MAJ Donald Royal of Chattanooga, Tenn., second brigade civil affairs officer, helped with the planning. LTC Ma Sonh Nhon, the present regiment commander who took over after Phuong left for another assignment, saw the nursery to completion. The 2nd Bde provided some of the supplies necessary to build the nursery. The 49th Regt supplied the labor and more supplies. Hoc Mon, the dependents housing area, sports a commissary, a maternity ward and a sewing class which makes school clothes for the children. The soldiers of the 49th Regiment and the 2nd Bde have painted all the classrooms at the Hoc Mon school, filled the previously muddy school yard with sand, and constructed latrines. "The brigade civil affairs section has provided some of the supplies," said Royal. "We have tried to channel some captured rice to the commissary at Hoc Mon," he continued. The brigade holds MEDCAPS twice monthly in the village. At a recent ceremony held for the nursery opening, Madam Nguyen Van Thieu, the Republic's first lady, spoke in praise of the joint effort. Albert Love Enterprises, Inc. has extended the deadline for ordering the 25th Inf Div 1966-67 yearbook to Jan. 1. They credit this extension to the excellent response received thus far, and their desire for troops just returning from the field to have a chance at ordering. Purchasers may pick up an order blank from their orderly room or at the Div Information Office. The book costs only $4. Firing a mortar mission at night is tough enough, but when your aiming stake is surrounded by angry water buffaloes and infantry troops need your help, you've really got a problem. The weapons platoon of Delta Co, 2nd Bn, 27th Inf "Wolfhounds," faced just that situation recently 53 kms northwest of Saigon when four buffaloes wandered away from an old Vietnamese farmer and flocked around the unit's aiming stake. The stake is used at night by mortar crews as a reference point for rapid aiming. While the 25th Inf Div soldiers attempted to move the animals a combat patrol radioed in a call for supporting mortar fire. The old farmer and the crew members doubled their efforts, but the harder they tried the madder the buffalo became. After some quick calculations the crew fired the mission with a substitute stake and the rounds landed right on target. DAU TIENG - A recent search and destroy mission of the 2nd Bn, 12th Inf, northeast of the 3rd Bde, 25th Inf Div, base camp accounted for a kill of 18 Viet Cong, destruction of three enemy base camps and a cache of ammunition and other Viet Cong supplies. The battalion, under the command of LTC R.D. Tice, had its largest kill of the sixteen day sweep when Alpha Co and the reconnaissance platoon made contact with an estimated company of the 271st Viet Cong Regiment, killing 14 enemy. The ammunition cache, which was uncovered during the sweep, consisted of both large and small arms ammunition. Included in the find were 300 rounds of AK-47 ammunition, 25 RPG-7 rounds, 20 boosters for RPG-7 rounds, 150 pounds of TNT, 200 feet of detonating cord, 5 CHICOM grenades, 1 mortar sight and 2 quadrant plates. In addition to the ammunition uncovered, the 2/12 "White Warriors" found medical supplies and enough field gear to outfit a platoon of Viet Cong. Much of the field gear found was new.